There is nothing a quilter likes more than a new gadget! We love our tools and care for them with a reverence akin to a good friend. I broke my favorite acrylic ruler a few years ago and mourned its loss for weeks. Of course I still have the two halves and use them when I need a shorter ruler! But a quilter’s tools can also be serious business. In this video, Barb Sackel presents a great list of the basic tools all quilters should have. In the video Barb briefly discusses thread. I would like to share some important information about selecting a good thread. Polyester, Poly-Cotton, and Cotton threads which are used in quilt piecing and garment sewing comes in a variety of thicknesses, or weights. This can be confusing and choosing the right thread becomes easier when you know some of the qualities of thread. Thread is made of a series of filaments, twisted together and wound on a spool. The number of filaments and the tightness of the twist all affect thread performance. Typically quilters choose a medium 50 weight three-ply thread for most sewing tasks. Here is what that means. The most common weight system specifies the length of the thread in kilometres required to weigh 1 kilogram. Therefore, a greater weight number indicates a thinner thread. For example 100 weight thread is very fine. (100 kilometres of this thread is required to equal 1 kilogram) 50 weight thread is common for sewing and quilting. 30 weight thread is heavier and thicker. So which thread should I use? Many quilters prefer 50 weight 3ply cotton or poly/cotton thread for piecing. If you are paper piecing you may want to use a slightly heavier thread (40 weight) and a 14/90 needle to perforate the paper better and stand up to the tugging of paper removal. If you are doing a miniature quilt with tiny pieces, consider using 60 weight thread (and a size 10/70 needle) to reduce bulk in your seams. 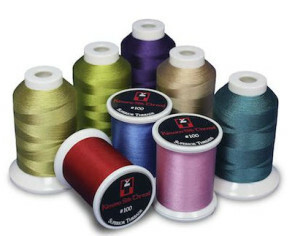 Polyester thread is a synthetic fiber with great strength and durability. Because it can be dyed easily it comes in a huge range of colors and is generally less expensive than cotton thread. It tends to have a sheen, because the synthetic fibers catch the light and are slightly reflective. It is the go-to thread for machine embroidery for this reason. Both cotton and poly thread can be variegated or striped to create a multicolor effect. The better variegated threads have a shorter color repeat (from an inch to several inches). Cheap variegated threads will have a longer repeat of 12″ or more and don’t blend in quite as well in projects. 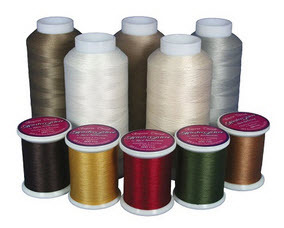 Silk thread is fine, expensive and lovely to work with. It is great for hand applique and and machine applique. It comes in a variety of weights as well. 50 weight silk is great for machine applique. 100 weight silk is very fine and is used for heirloom hand stitching or hand applique. Silk dyes beautifully so there are lots of colors to choose from, but the cost of silk often puts quilters off. 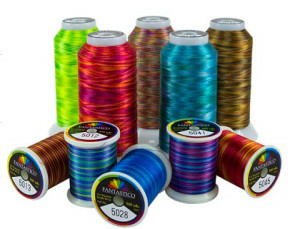 Each spool of thread is marked with the color, fiber, number of plys or filaments, and weight or TEX of the thread. Next time you are shopping for thread read the label. You will be amazed what you can learn from such a tiny circle! This entry was posted in Helpful Tips, Helpful Tools, Notions, Techniques, Video. Bookmark the permalink. Is Gutermann’s (sp) really the best thread? I’ve always heard it was and just wondered. Brenda- in response to your question about Gutermann’s thread- NO it is not the best- there are many brands out there as well as different types of thread-It is a good one- But in my experience not the best- It comes down to a matter of preference & trial & error- Finding the brand that works well with your machine,too. Like a car- you may prefer a certain brand after you test drive a few ! For basic piecing cotton threads are the best- I prefer Superior Masterpiece- cotton thread – I have neutral shades for all my piecing- greys work very well with all colors of fabric, blending . I use polys to top stitch or “decorate” my projects- as polys are very strong. I have used different threads in my bobbin – with no problem- depending on what I am making at the time. Superior Threads has a web sight with tons of information- charts – guides & in my personal opinion they are the best thread makers out there! You kind of get what you pay for – spending a good amount on fabrics – think about the thread is what “holds” the fabric together – you want good quality – I sew garments as well as quilts etc. Have fun sewing!